BACKGROUND: Health literacy is a combination of reading and listening skills, data analysis, decision-making, and the ability to implement these skills during the necessary health situations. This study was conducted with the purpose of determining the effect of educational intervention on health literacy and its impact on health-promoting behaviors of the health ambassadors in the health and treatment centers of the health network in Kazeroon (Fars province, Iran). MATERIALS AND METHODS: The present study is a quasi-experimental study using before-after test procedure on 256 health ambassadors. Random systematic sampling method was used and to assess the health literacy, Montazeri's health questionnaire was used, also the standard questionnaire (health-promoting lifestyle profile-I) was applied to determine the status of the health-promoting behaviors. Two questionnaires were filled out by the health ambassadors before and following the intervention. Data analysis was performed using SPSS software 22, through t-test, ANOVA, and Pearson correlation. RESULTS: The mean health literacy scores of the ambassadors before educational intervention were 79.22 which increased to 95.49 after intervention. Moreover, the results of the study showed a direct significant correlation of health literacy with all the dimensions of health-promoting behavior questionnaire before and after the intervention (P < 0.001). CONCLUSIONS: Educational interventions can be used to enhance the health literacy of health ambassadors and have a significant impact on improving health-promoting behaviors. Health literacy is a combination of reading and listening skills, data analysis, decision-making, and the ability to implement these skills in health situations, which do not depend on the years of education or any other qualifications. Currently, the World Health Organization has introduced health literacy as one of the major determinants of health affair. Various studies have shown that low levels of health literacy lead to a delay in timely diagnosis of diseases, disability in self-care abilities, the increased use of emergency services, an increase in the incidence of various diseases, and ultimately an increase in the rate of mortality in people. A systematic investigation regarding studies conducted on this subject by Paasche-Orlow et al. in North America depicted that about 26% of the people in general presented low health literacy and 20% were with marginal health literacy levels. In addition, the results of a research on investigating the health literacy and its effective factors in five provinces (Bushehr, Kermanshah, Qazvin, Mazandaran, and Tehran) in Iran by Tehrani Bani Hashemi et al. showed that total health literacy in Iran is low. Consequently, the peoples' illiteracy in the health domain leads to problems such as insufficient use of prevention services, excessive delay in diagnosis, insufficient adherence to medical guidelines, increased risk of hospitalization, increased risk of death, and much more health-care costs. Health-promoting behaviors are one of the major criteria of health determinants, which is regarded as a background factor in preventing many diseases. Several studies have shown that health-promoting behaviors as well as a healthy lifestyle have a significant effect on prolonging life and life expectancy. Due to this potential in the ability to prevent the development and progression of chronic diseases, reduce pathogenicity, improve the quality of life, and reduce the burden of health care, health-promoting behaviors play an important role in the community. Therefore, promoting health is the best strategy for preventing noncommunicable diseases. The six important components of health-promoting lifestyle profile (HPLP) include health responsibility, physical activity, nutrition, stress management, spiritual growth, and interpersonal relations. The system of health services in Iran has taken valuable measures to provide better public health and to improve the quality of peoples' lives including the development of universal health coverage “in the form of” health transformation plan in the field of health. One of the targeted goals of universal health coverage is to enable people of self-care. “Self-care” consists of acquired, informed, and targeted actions that people practice for themselves, their children, and families to be healthy while protecting their physical, mental, and social health. To administer the national program of self-care, a member from every family will be chosen on a voluntary basis to represent as the health ambassador for that family. The criteria to be met by the health ambassadors are as follows: the member should possess education at least up to 8th grade with the ability to read and write and have the social responsibility of passing on the learned information regarding health on to other members of the family and community meanwhile caring for his/her own health as well. In other words, the key responsibility of the health ambassador is to develop the culture of self-care while maintaining and improving the health of the family members as well. Although several studies had been previously carried out in the field of health literacy and health-promoting behaviors in different groups, to the best of our knowledge, there has not been any study pertaining to the evaluation of health literacy of health ambassadors so far. Hence, in this study, the impact of education on health literacy and its relationship with health-promoting behaviors of the health ambassadors in the health and centers of the health network in Kazeroon has been investigated. The present study was conducted using a quasi-experimental before-after test research method. The research population consisted of health ambassadors in the health and treatment centers of health network in Kazeroon. Inclusion criteria were education level at least up to 8th grade with reading and writing literacy, to volunteer as a health ambassador, willingness to participate in the study, Iranian nationality, and Kazeroon residency. Moreover, the ambassadors who did not want to participate in the training sessions during the intervention was excluded from the study. Two hundred and fifty-six health ambassadors with all the criteria for entry participated in this study on the basis of their list in the System Integrated Health (SIB) using a systematic random sampling selection method. The health ambassadors first filled the written informed consent form and then completed the health behavior promotion questionnaire. Then, training sessions were performed using the book “self-care in minor morbidities” designed by the Ministry of Health and Treatment, Department of Health Education through self-study and in-person training. Four weeks after the educational intervention, the research questionnaire again was given to the health ambassadors to be filled out. Then, the completed questionnaires were collected by the researcher. The data were collected using three questionnaires that were the demographic information questionnaire, health literacy questionnaire, and health-promoting behaviors' questionnaire. The demographic information questionnaire included questions concerning age, marital status, gender, education, occupation, and how health information was obtained. To evaluate health literacy of the subjects under study, health literacy questionnaire (33 items on a five-point Likert scale) designed by Montazeri et al. was used. Content validity and face validity of health literacy questionnaire were examined and approved by experts, and a comprehensive review was performed by a group of experts in the field; the value of Cronbach's alpha within the range of 0.72–0.89 was calculated. The answers to the questions were according to the 5-point Likert scale (always, often, sometimes, rarely, and never) with scoring procedure as 4 (always), 3 (often), 2 (sometimes), 1 (rarely), and 0 (never). In the health literacy questionnaire, scores' domain was defined as 0–132. Based on the distribution of 50%, 75%, and 100%, if an individual's score was 0–66, he/she had inadequate health literacy, the score 67–100 was identified to possess marginal health literacy, and a health literacy score of 100–132 was considered adequate. To determine the status of the health-promoting behaviors, the standardized questionnaire (HPLP-II) was used. The questionnaire composed of 52 items encompassing two categories and six subcategories which are as Category 1: health-promoting behavior including subsets as health responsibility, physical activities, and nutrition, and Category 2: psychosocial welfare including subsets as spiritual growth, interpersonal relations, and stress management. The answers to the questions were according to the 5-point Likert scale (always, often, sometimes, rarely, and never) with scoring procedure as 4 (always), 3 (often), 2 (sometimes), 1 (rarely), and 0 (never). In health-promoting behaviors' questionnaire, the scores' domain was designed within six dimensions consisting responsibility, physical activity, nutrition, spiritual growth, interpersonal relationship, and stress management. For each component, the mean and standard deviation were calculated. Reliability and validity of the health-promoting behaviors' questionnaire have been extensively reported in the health-promoting studies and in different populations such as college students, teens, and adults. This project was reviewed and approved by the Ethics Committee of the Shiraz University of Medical Sciences and received the code: IR.SUMS.REC.1396.12.8. The collected data were analyzed using a statistical software package IBM SPSS version 16 (IBM, USA SPSS software version 16 (statistical pakage for the social sciences) and descriptive statistics, frequency distribution tables, and statistical tests (t-test, ANOVA, and Pearson's correlation coefficient at significance level of 0.05). The data revealed that the mean age of the participants in this study was 33.75 ± 9.90. Nearly 84% of them were women and 16% were male. Almost 79% of the participants were married and 21% were single. In terms of education, 42% had diploma, 21% had an associate degree, 36% bachelor's degree, and 1% master's degree. Almost 68% of the people in the study were housewives, and 32% were employees. The participants in this study received the relevant information concerning health and disease initially through internet (32.2%) and then through training manuals and brochures (20.7%), radio and TV (18.4%), staffs' information (17.6), newspaper, journals, and magazines (5.9%), interactive voice response (6.1%), and friends' information (8%). 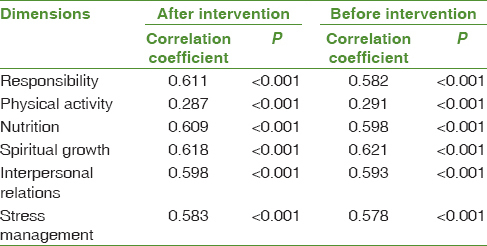 [Table 1] shows the scores of health literacy before and after intervention. The results of the study showed that 25.8% of the subjects in this study had sufficient health literacy before intervention which increased to 50% after the educational intervention. The mean health literacy scores of the subjects under study were 79.22 before the educational intervention which increased to 95.49 after educational intervention. Thus, a meaningful relationship was observed between the health literacy score of the subjects before and after the educational intervention. 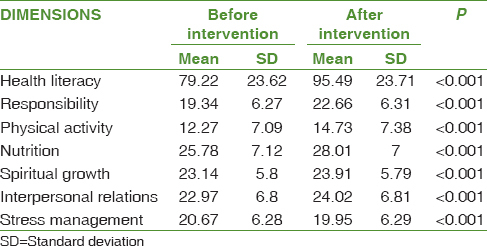 [Table 2] shows the mean, standard deviation, and error levels in health literacy and the dimensions of the questionnaire related to the health-promoting behaviors of the subjects in the study before and after the educational intervention. The mean score of the subjects under study for all dimensions in the questionnaire related to the health-promoting behaviors (responsibility, physical activity, nutrition, interpersonal relations, and stress management) showed an increase after the educational intervention. According to the results, a meaningful relationship between the various dimensions mentioned in the questionnaire related to the health-promoting behaviors before and after the intervention was noticed. With respect to before and after educational intervention, the highest and lowest mean score was related to the nutrition and physical activity, respectively. There was a significant relationship between health literacy and gender (P < 0.05). On the other hand, the mean score of the health literacy of women ambassadors was higher than the health literacy of male ambassadors before and after the educational intervention. Among the various dimensions of the questionnaire related to the health-promoting behaviors, a meaningful relationship was observed only between physical activity and gender (P < 0.05). The mean score of the physical activity related to men was higher than those related to women before and after educational intervention. No significant relationship was observed for other dimensions. Among the various other different dimensions of the questionnaire related to the health-promoting behaviors, a significant correlation was seen only between physical activity and marital status (P < 0.05). There was no relevant relationship between the health literacy and marital status. However, before and after educational intervention, the mean score of the single participants was higher than the mean score of the married subjects in the study. No noteworthy relationship was observed between other dimensions of the questionnaire and marital status. No correlation between age and health literacy and other aspects of questionnaire related to the health-promoting behaviors before and after the intervention was noted. The highest mean score of the health literacy before and after the educational intervention was related to the health ambassadors in the first place with master's degree, then bachelor's, associate, and diploma. There was a meaningful relationship between health literacy and all dimensions of questionnaire related to the health-promoting behaviors and education level of the subjects under study (P < 0.001) [Table 3]. The results of this study showed that health literacy had a direct notable correlation with all the components of the health-promoting behaviors' questionnaire before and after the intervention. The results of the present study revealed that 74% of the health ambassadors had inadequate marginal health literacy. This finding is in line with the results reported by Paasche-Orlow et al.,(3) Tehrani Bani Hashemi et al., Javadzade et al. and Tavousi et al. The present study indicated that the mean score of the health literacy related to the health ambassadors increased after the educational intervention. This result was in line with the studies conducted by Julie et al., Kandula et al. These findings suggest that the health literacy-based training program could enhance the level of the health literacy of the subjects in the study. The findings revealed a significant relationship between health literacy and gender. Moreover, it was seen that the mean score of the health literacy of women health ambassadors' women was higher than men before and after the educational intervention. In a study by Tehrani Bani Hashemi et al., and Afshari et al., it was demonstrated that health literacy level was higher in women. However, on the contrary, in a study conducted by Javadzadeh et al., Williams and Linndstorm, inadequate health literacy was more common in women which was attributed to their low education level. The possible reasons for the higher health literacy of women in the current study and some similar studies would be related to the fact that women frequently visit more health centers, wherein they acquire more knowledge. Furthermore, in this study, there was no significant correlation between health literacy, age, and marital status. In a study conducted by Javadzadeh et al., an important relationship was observed between health literacy, age, and marital status such that older people showed lower health literacy levels and married people revealed a higher health literacy level. The results of the current study showed that health literacy had a direct relationship with education level. This means that, with an increase in education level, the mean score of the health literacy would increase. These results were in line with those reported by Javadzadeh, Montazeri et al., and Sentell and Halpin. The results in this research indicated that health ambassadors would receive the health- and disease-related information initially through internet and then through training manuals and brochures, radio and TV, as well as asking the health staffs. A study by Tavousi et al. Showed that people receive most of the health-related information first through radio and TV and then asking the doctors and health staffs as well as through internet search. Due to the widespread and considerable use of internet, radio, TV, newspapers, and magazines also being a source of information accessible for most people, hence, it is vital to prepare a variety of standard educational programs appropriate to different ages and genders for all people particularly those related to the health and treatment systems including health ambassadors through media networks which are widely accessible to all these days due to the growing trend of technology. In the present study, the results correlated to the increase in the health-promoting behaviors in six various dimensions after educational intervention were investigated. The highest mean value was related to nutrition and the lowest mean was related to the physical activity domain. The excessive indulgence with computers and electronic equipment by today's generation is the primary cause of the decreasing trend toward exercise and physical activities. In a study by Raiyat et al., the highest mean value was related to spiritual growth and the lowest mean value was in the domain of responsibility. In the study conducted by Khazaie et al., the highest mean was noted in the domain of spiritual growth, and the lowest one was related to physical activity. Moreover, the health-promoting behaviors for both sexes were compared, and the results revealed that the mean score of male health ambassadors for physical activities was higher than female ambassadors before and after the educational intervention. This suggests that men have more opportunities to involve in physical activities. On the other hand, women role as the main caretaker, having multiple roles in the family provide them with fewer opportunities for exercise and physical activities. The results reported in the study by Lee on Hong Kong University students were consistent with the findings in this study. However, women's scores concerning responsibility, nutrition, spiritual growth, interpersonal relationship, and stress management were higher than men before and after the intervention, but the results were not statistically significant. In a study carried out by Mazloomi Mhamoodabad et al., the mean score of health-promoting behaviors was slightly higher for female professors than male professors, but it did not reveal a significant meaningful difference. On the other hand, the results reported by Pirincci et al. showed that men have practiced a more suitable lifestyle than women to improve their health. Comparing the health-promoting behaviors in terms of marital status showed that, both before and after the intervention, the scores of single health ambassadors were higher than married participants in their physical activities. This could be accounted for by the fact that single people have more opportunities and can afford more time to involve in physical activities in comparison to married people. Although the scores in the domains such as responsibility, nutrition, spiritual growth, interpersonal relationship, and stress management were higher for married health ambassadors compared to single ones, no important statistical difference was shown in this respect. In the study by Mazloomi Mahmoodabad et al., the scores of married professors were higher based on physical activities and nutrition compared to unmarried professors, and in addition, the other dimensions of health-promoting behaviors did not show any meaningful relationship concerning their marital status. Concerning the education level, health-promoting behaviors were also compared. When health-promoting behaviors were compared based on education level, the findings revealed that the highest score for health-promoting behaviors was found in health ambassadors with master's degrees and the lowest score was found in those with diploma. Thus, the results depicted a meaningful relationship between all dimensions that were part of the health-promoting behaviors' questionnaire with education level. The obtained results were consistent with those reported by Seyedoshohadaee et al. and Sohng et al. Pearson correlation test showed that there was a direct meaningful correlation between health literacy and various dimensions of the health-promoting behaviors questionnaire (responsibility, physical activity, nutrition, spiritual growth, interpersonal relationship, and stress management) in the subjects under study. These results were in accordance with a review study by Speirs et al., and Aghamolaei et al. In the study by Seyedoshohadaee et al., there was a significant relationship between health literacy and only two dimensions of self-care behaviors, namely, adherence to the diet and adherence to the drug regimen. One of the limitations of this study was the effect of individual differences and their personality traits, as well as the psychological and mental states of the people under study while responding to the questionnaires, and the extent of interest in this project and other educational activities that were beyond the control of the researcher. Based on the findings of the present study, an increase in the health literacy of health ambassadors could lead to improvements in their health-promoting behaviors. More than half of the participants in this study did not reveal adequate health literacy. This suggests the need for effective training in the field of self-care as well as creating the culture of self-care. The overall purpose is to improve the health literacy level of the society as well as to attain desirable and suitable health-promoting behaviors. The ultimate result of this study showed that there was a noteworthy relationship between health literacy and health-promoting behaviors. The efforts made by health-care providers in health centers could motivate health ambassadors, providing them with the necessary trainings to improve the society's health condition. This article has been extracted from Ms. Tahereh Bayati's master's thesis in Medical Education and has been approved by the Vice-Chancellor of Research, Shiraz University of Medical Sciences. We hereby express our gratitude to the participants in this study. Afshari M, Khazaei S, Bahrami M, Merati H. Investigating adult health literacy in Tuyserkan City. J Educ Community Health 2014;1(2):48-55. Saranjit S, Lennard L. Health literacy: Being able to make the most of health. National Consumer Council; 2004. Paasche-Orlow MK, Parker RM, Gazmararian JA, Nielsen-Bohlman LT, Rudd RR. The prevalence of limited health literacy. Journal of general internal medicine 2005;20(2):175-84. Banihashemi S-AT, Amirkhani MA. Health literacy and the influencing factors: A study in five provinces of Iran. journal of Strides in Development of Medical Education 2007;4(1):1-9. Powers BJ, Trinh JV, Bosworth HB. Can this patient read and understand written health information? Jama 2010;304(1):76-84. Aghamolaei T, Darsareh F, Poorahmad-Garbandi F, Ghanbarnejad A. Relation between health locus of control with health-promoting behaviors of high school students in Bandar Abbas, Iran. Journal of Preventive Medicine 2015;2(2):1-9. Hosseini M, Yaghmaei F, Hosseinzade S, Alavi MH, Sarbakhsh P, Tavousi M. Psychometric evaluation of the” health promoting life style profile 2. PAYESH 2012;11:849-56. Aubi E, Shadnoush M, Nazarzadeh M, Bidel Z, Ranaei A, Delpisheh A. Translation and assessment of validity and reliability of the health-promoting lifestyle questionnaire, using factor analysis. Pajoohandeh Journal 2012;17 (3):114-20. Hosseini M, Ashktorab T, Taghdisi M. Health promotion lifestyle in nursing students: A systematic review. J Health Promot Manag 2013;2:66-79. Montazeri A, Tavousi M, Rakhshani F, Azin SA, Jahangiri K, Ebadi M, et al. Health Literacy for Iranian Adults (HELIA): Development and psychometric properties. 2014. Mazloomi MS, Fazelpour S, Askarshahi M. Health-promoting behaviors and psychosocial well-being of University Shahid Sadoqi Yazd Academic Staff in Iran. 2013. Javadzade SH, Sharifirad G, Radjati F, Mostafavi F, Reisi M, Hasanzade A. Relationship between health literacy, health status, and healthy behaviors among older adults in Isfahan, Iran. Journal of education and health promotion. 2012;1. Tavousi M, Haeri MA, Rafiefar S, Solimanian A, Sarbandi F, Ardestani M, et al. Health literacy in Iran: Findings from a national study. 2016:95-102. Julie M, Cooper BS, Marguerite R, Davenport BA, Kriya K, Gaillard BS. Health Literacy in Practice Program Evaluation. Kalamazoo, MI: Western Michigan University; 2011. p. 1-156. Kandula NR, Nsiah-Kumi PA, Makoul G, Sager J, Zei CP, Glass S, et al. The relationship between health literacy and knowledge improvement after a multimedia type 2 diabetes education program. Patient Educ Couns 2009;75:321-7. Javadzade H, Sharifirad GH, Reisi M, Tavassoli E, Rajati F. Health literacy among adults of Isfahan, Iran. J Health Syst Res 2013;9:540-9. Montazeri A, Tavousi M, Rakhshani F, Azin SA, Jahangiri K, Ebadi M, et al. Health Literacy for Iranian Adults (HELIA): Development and psychometric properties. 2014;589-599. Sentell TL, Halpin HA. Importance of adult literacy in understanding health disparities. J Gen Intern Med 2006;21:862-6. Raiyat A, Nourani N, SamieiSiboni F, Sadeghi T, Alimoradi Z. Health improving behaviors in students of Qazvin secondary schools in 2011. J Health 2012;3:46-53. Khazaie T, Khazaie T, Kianfar S. Health-promoting behavior factors among students of Birjand University of Medical Sciences. Iranian Journal of Health Education and Health Promotion. 2015;3 (2):125-32. Lee RL, Loke AY, Wu CS, Ho AP. The lifestyle behaviours and psychosocial well-being of primary school students in Hong Kong. Journal of clinical nursing. 2010;19(9-10):1462-72. Pirincci E, Rahman S, Durmu AB, Erdem R. Factors affecting health-promoting behaviours in academic staff. Public health. 2008;122(11):1261-3. Seyedoshohadaee M, Barasteh S, Jalalinia F, Eghbali M, Nezami M. The relationship between health literacy and self-care behaviors in patients with type 2 diabetes. Iranian Journal of Nursing Research. 2016;10(4):43-51. Sohng KY, Sohng S, Yeom H. Health Promoting Behaviors of Elderly Korean Immigrants in the United States. Public Health Nursing. 2002;19(4):294-300. Speirs KE, Messina LA, Munger AL, Grutzmacher SK. Health literacy and nutrition behaviors among low-income adults. J Health Care Poor Underserved 2012;23:1082-91. Aghamolaei T, Hosseini Z, Hosseini F, Ghanbarnejad A. The Relationship between Health Literacy and Health Promoting Behaviors in Students. Journal of Preventive Medicine. 2016;3(2):37-43.